The idea of disability rights in theory is simple. Why should someone get inferior treatment or a less equal chance because they have a disability? In practice however, things are far from that simple. Of course, no one is allowed to discriminate against anyone else on the basis of a disability, but far more complicated issues come into play when looking at, for example, the suitability of an applicant for a job. One cannot discriminate against a disabled person by not giving them a job – but what happens if they cannot do the job they have applied for? In addition, all businesses and public premises must now make sure they are accessible to all people – regardless of ability. So, the law clearly states that employers cannot discriminate against people on the basis of their disability. This goes further than just giving everyone a fair interview and a fair go at the recruitment process. When an employer discovers that a disabled person has applied for the job they must make the necessary adjustments to make sure they have a fair chance at the job. This also includes making any changes necessary if that person were to be the best person for the job and get it. Employers are allowed to ask for certain skills if that is included in the job. So, it would not be discriminatory to ask for a person with good fitness levels if the job involved leading hill walks in a national park. However, it would be against disability rights to ask for a good level of fitness if the job was a desk job which included little or no walking or other physical exertion. Once a person is in the job, they must not be discriminated against because of their disability – they must be given all the chances everyone else is given to prove themselves and do their job. Access is very important for all people who have public buildings to be aware of. It is wrong and against the law to deny disabled people equal rights because there are only stairs going in to a building or no lifts inside. 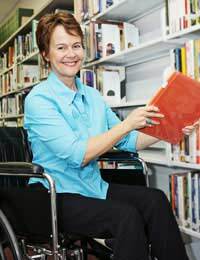 Businesses and other organisations must make due changes to ensure that their buildings are as accessible as possible. A key thing here is to remember that it does not have to become totally impossible to get access before changes have to be made. Business owners and service providers must also take into account the loss of dignity that may well come from a situation such as sitting in a wheelchair outside while someone comes out to you because there was no ramp to access the building. Access does not just cover access to physical buildings; it may also cover access to services. If you are prevented from being able to access a service because of a disability, then you are being discriminated against – and again, the service provider must make all of the necessary changes to allow you to use that service. These just scratches the service of disability rights and what they mean – there are many other spheres where disabled people could come up against prejudice. Everything is covered by the Disability Discrimination Act, which is where anyone should turn if they want to clarify a point of law. For help, the best place is the disability and human rights commission.